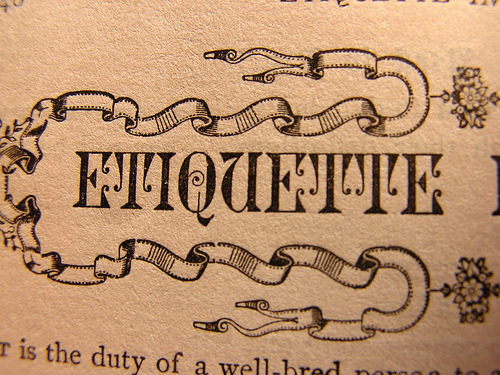 Emily Post Online: About LinkedIn Etiquette | New PR Words - and Music! Curmudgeonly – no! Your crankiness is justified. If you’re growing your LI network carefully, you should absolutely expect and demand the kind of social etiquette you’ve blogged about. But here’s some perspective from the other end of the LinkedIn network development spectrum. After attending a webinar on how to kick-start your LinkedIn network, I opted to become an “open networker”, meaning that I would not only go out and grab a database full of other LinkedIn Open Networks (LION’s) but that I would also accept connection invites from any and all comers. Within a week I had 1500+ connections. Unlike many LION’s who continue pulling in huge numbers of connections and exhausting their rights to invite, I stopped going out to the LION databases for more. I was frankly worried about losing control of my network. A year into this experiment, my jury is still out. On the plus side, it’s rare for me to search for someone with whom I don’t have at least a third level connection. But the quality of these connections is tenuous and can’t often provide the kind of warm intro that I’d ask of one of my primaries. For the most part, the other open networkers do not seem to be abusing the privilege of being connected to me. On the downside, the 16,212,080+ professionals that my now 1600+ connections link me to are a massively diverse crew that doesn’t often line up with my needs to connect. The bottom line – Open networking for me has been a quantitative success, but without much to show on the qualitative side. Great comments. Thanks for adding an important element to the network quality conversation. And glad you didn’t think I was too cranky.